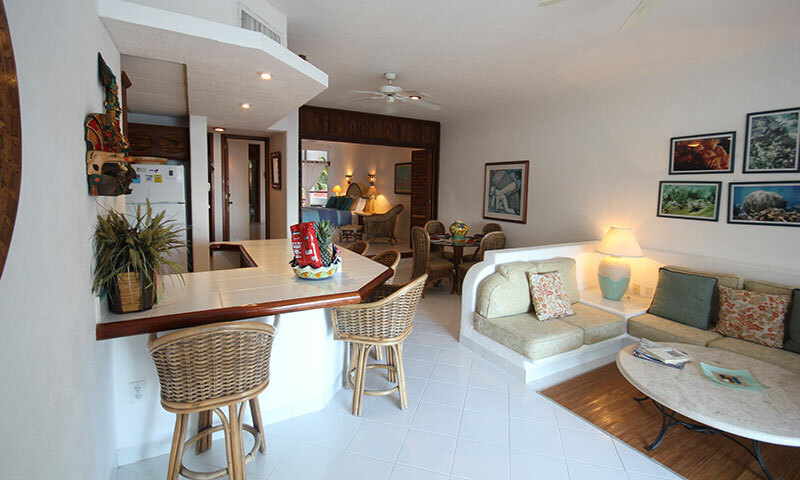 Playa Caribe offers two styles of their 2 bedroom units. The larger units include a spacious master bedroom, with a king bed, large private bath and rear patio. 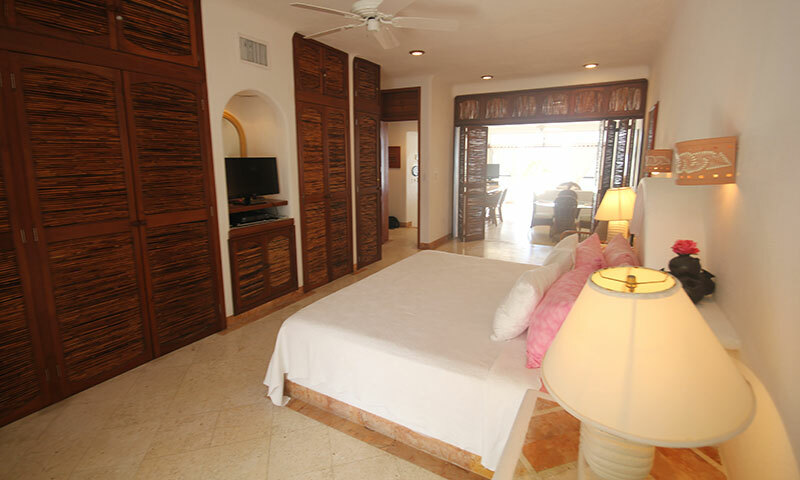 The guest bedrooms are furnished with two double beds and a private bath. These vacation homes can accommodate up to six guests. The smaller units have a nice master with a king bed and private bath. 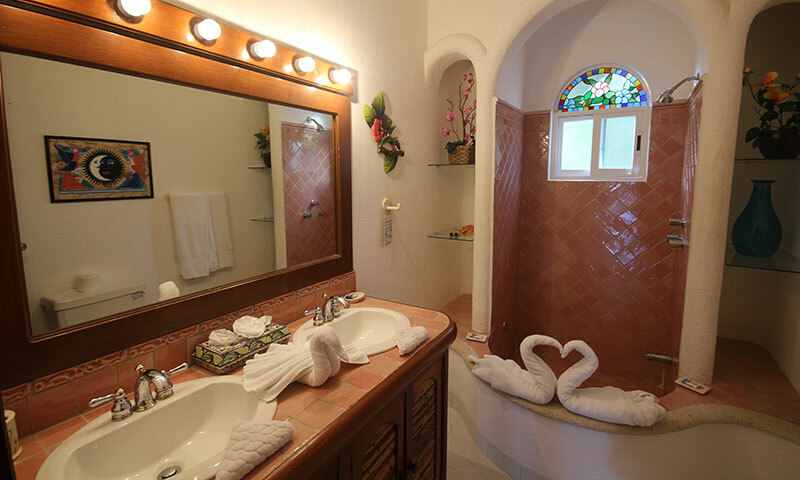 The guest rooms are furnished with a queen bed and also a private bath. 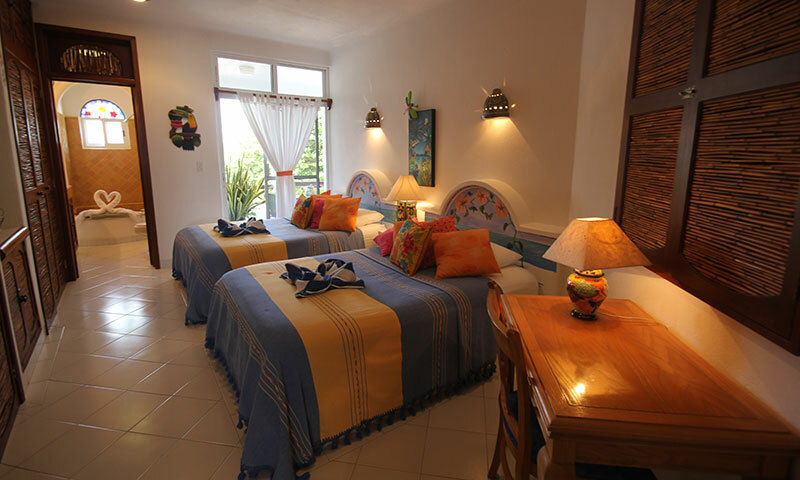 These accomodations are good for small families or friends, they will accommodate up to 5 guests. They are also a bit closer to the ocean and have excellent Caribbean views. Both types can be rented as 1 or 2 bedrooms, depending on availability. Large 2 bedroom units are numbers 1, 3, 4, 6, 7, 9, 10 and 12. Junior 2 bedroom units are numbers 2, 5, 8, and 11. 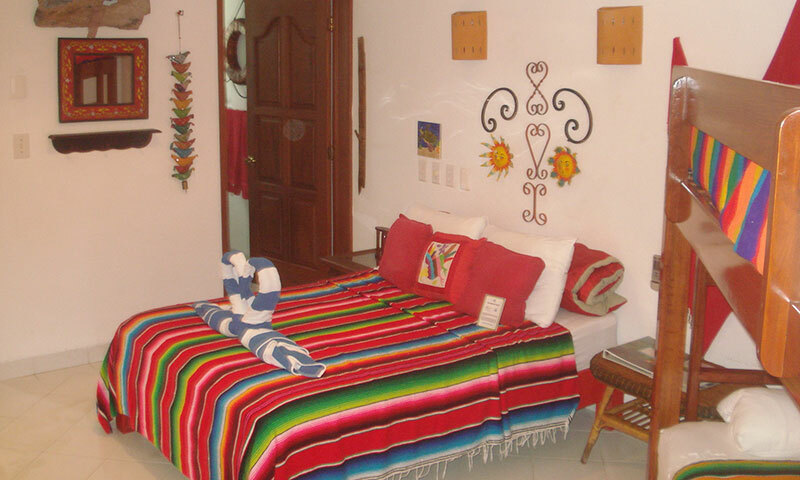 There are three economically priced non-ocean view casitas, same quality, just smaller. While all the condominiums are individually owned and vary slightly in decor, there is a central theme that exudes casual luxury. 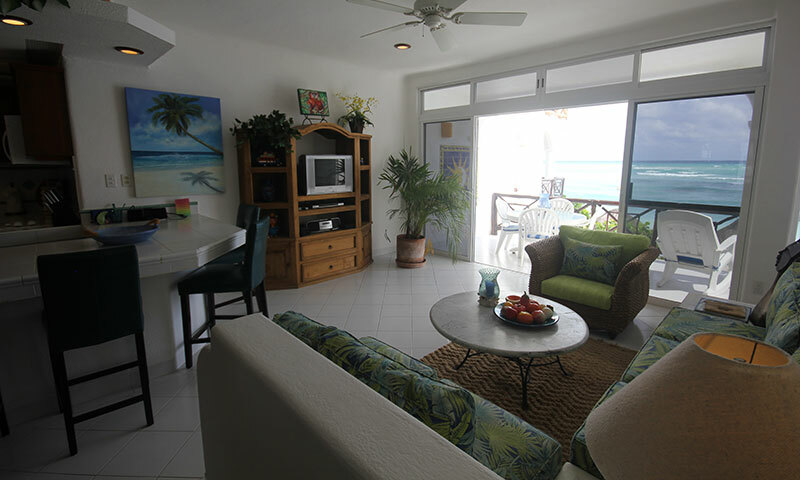 All units have very well appointed kitchens, living and dining areas with ocean views, pillow top mattresses, plush towels, DISH network satellite TV, wireless Internet, central air conditioning, furnished ocean side terraces, and are supplied with potable water from Playa Caribe's own reverse osmosis system. 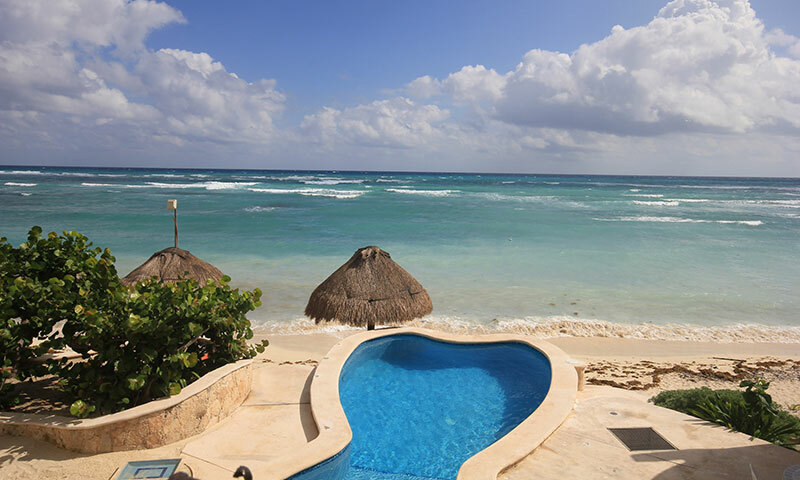 Each condominium has a luxurious Mexican tiled tub for relaxing. The building is located directly ocean front on Half Moon Bay. All the vacation homes have incredible Caribbean water views. There is a pool, shade palapas and loungers on the beach. 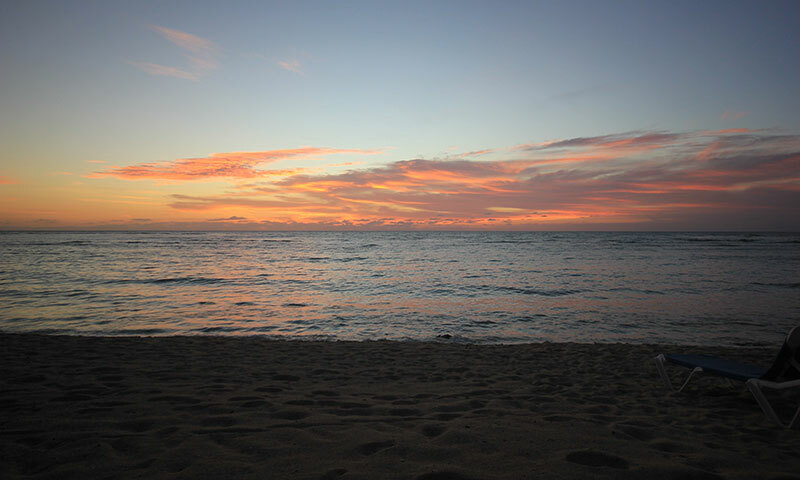 Half Moon Bay is protected by a natural coral reef that is teeming with underwater marine life. Daily Sea Turtle and Stingray sightings are not uncommon. Turtle nesting/hatching season runs from June through mid November. There are four restaurants within walking distance, two of which are on the beach. Bicycles and golf carts are available for rent. Maid service is daily. This unit has and oceanview living area as well as a full kitchen with a breakfast bar and dining area. Both bedrooms are spacious, have ensuite bathrooms and plenty of closet space. 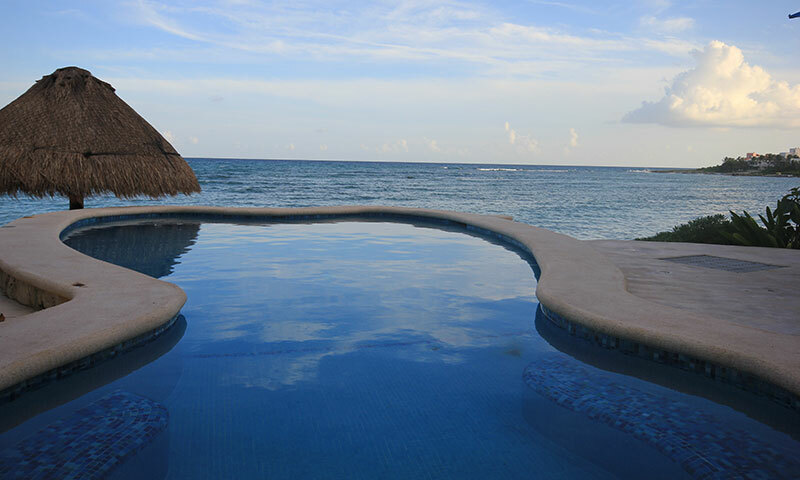 Playa Caribe #3 has great views, breezes and direct access to the pool. 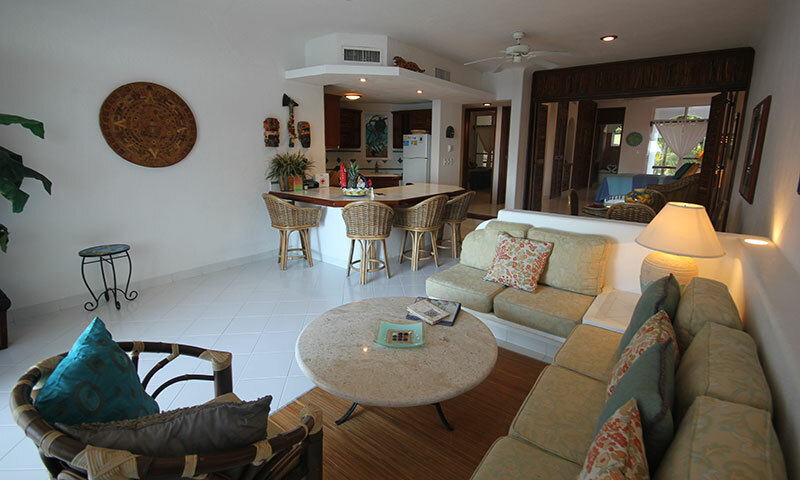 This vacation home has an oceanview living area as well as a full kitchen with a breakfast bar and dining area. Both bedrooms are spacious, have ensuite bathrooms and plenty of closet space. 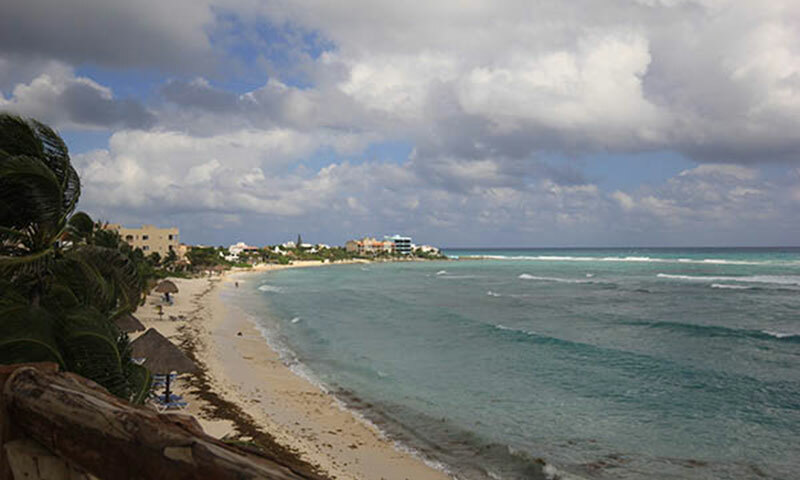 Playa Caribe #6 has great views, breezes and privacy from its second floor, end unit location. 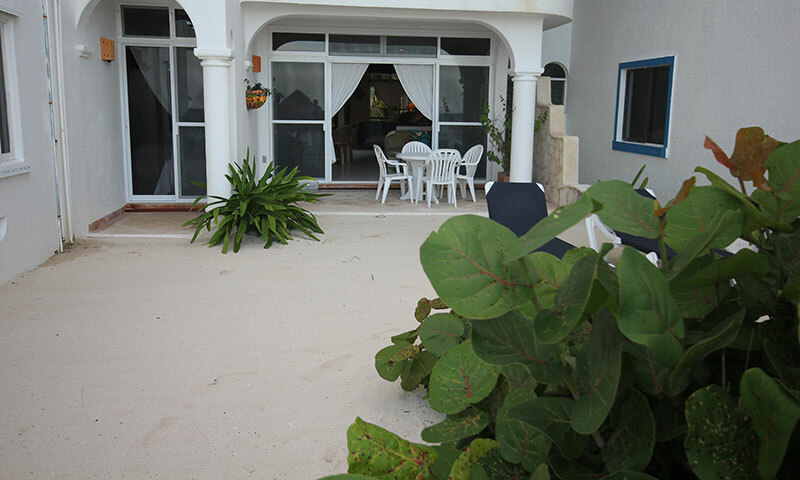 This vacation home has an oceanview living area as well as a full kitchen with a breakfast bar and dining area. 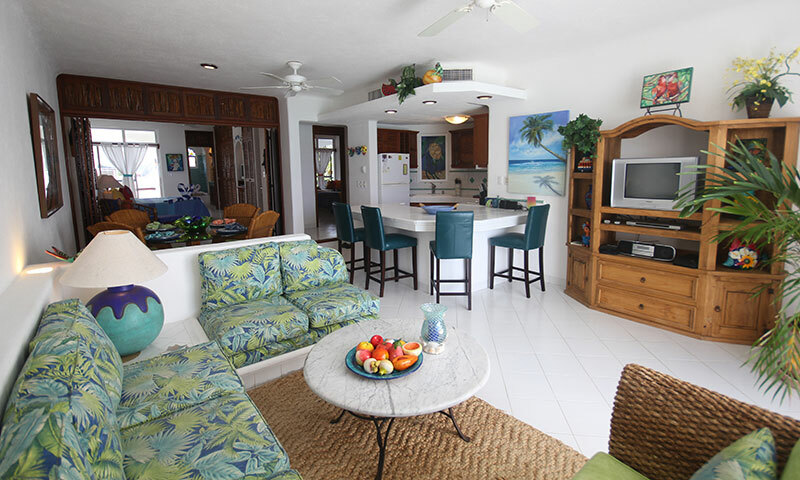 This vacation home has an oceanview living area with US DISH TV as well as a full kitchen with a breakfast bar and dining area. 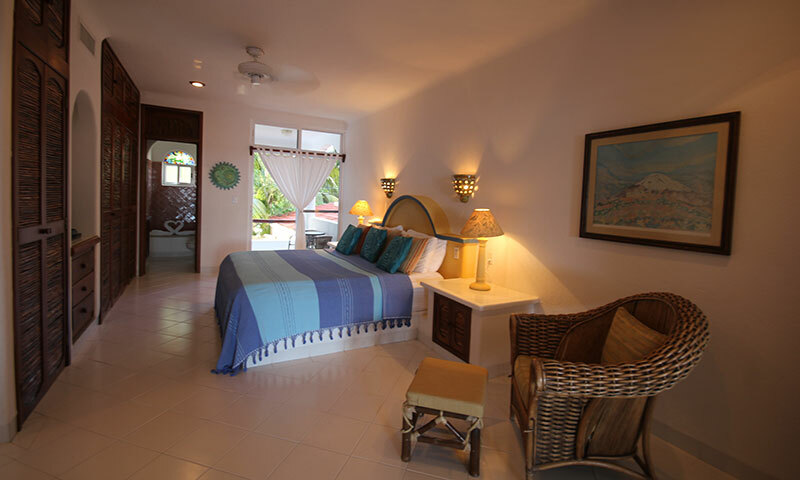 Both bedrooms have ensuite bathrooms, plenty of closet space and small private patios. 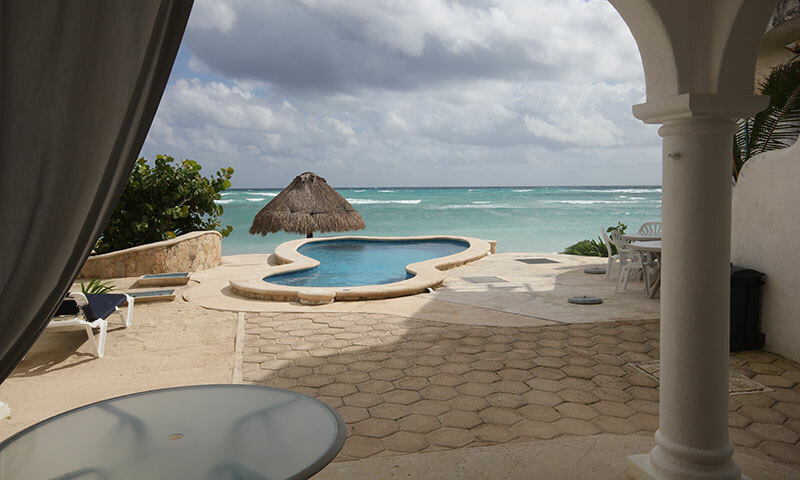 There are three economically priced non-ocean view casitas, same quality, just smaller. The building is located directly ocean front on Half Moon Bay. All the vacation homes have incredible Caribbean water views. There is a pool, shade palapas and loungers on the beach.